The first alumnus to win a Nobel Prize, Kenneth Wilson is a theoretical physicist honored for his work on critical phenomena in connection with phase transitions. He attends George School for tenth and twelfth grades (skipping his junior year) and heads to Harvard at age 16. There he majors in mathematics before graduate school at Caltech. 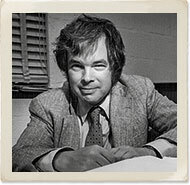 In 1963 he joins the Cornell University faculty and in 1985 becomes director of its Center for Theory and Simulation in Science and Engineering.